We have much to learn about the vagaries of climate. One of the most important means of doing so involves a fleet of satellites dedicated to the task of watching our changing planet. The Suomi National Polar Partnership satellite, or Suomi-NPP, is one of these spacecraft in continual orbit around Earth. Created and operated in a partnership between the National Aeronautics and Space Administration (NASA) and the National Oceanic and Atmospheric Administration (NOAA), the Suomi-NPP carries instruments specifically designed to measure shifting weather systems, changing land conditions, and ocean circulations. The satellite is named in honor of the late Verner Suomi, a University of Wisconsin–Madison professor today recognized as the father of satellite meteorology. It can be said that the era of weather satellites began here in Wisconsin. 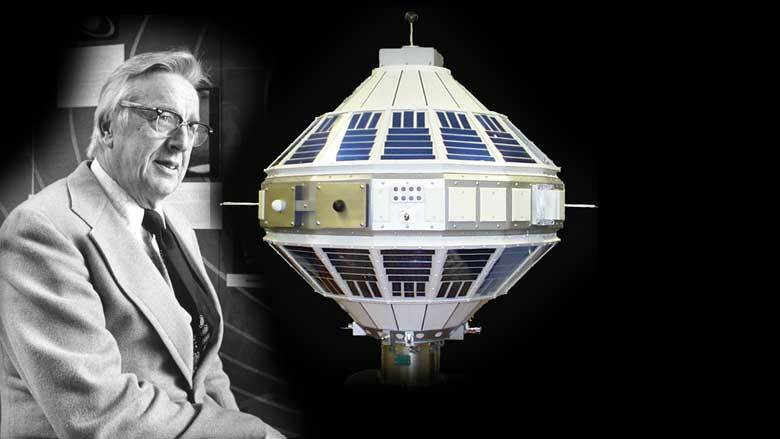 Professor Suomi’s very first satellite instrument, the flat-plate radiometer, was part of the Explorer 7 mission in 1959. The instrument was designed to measure the energy balance of the planet by determining how much solar energy is absorbed by our planet and how much energy is emitted out to space. This balance between absorbed and reflected energy is a fundamental measure of our planet’s climate. Successful experiments like Suomi’s flat-plate radiometer established the foundation for modern meteorology and quickly led to more advanced satellites and instruments whose primary focus was to improve weather forecasting. Only later would these satellites be understood as essential in the quest to understand our changing climate. The modern age of weather satellites began on December 6, 1966 with the launch of the first Applications Technology Satellite (ATS 1). Aboard ATS-1, a new instrument called a spin-scan camera made it possible to continuously image the entire Western Hemisphere and routinely monitor weather-system movements. Satellites carrying these special cameras travel in a fixed, circular orbit around the earth. This perfect synchronization of orbit makes these satellites appear stationary in the sky, leading to the name geostationary satellite. By 1967, ATS 3 provided the first full-color image of earth from space. Professor Suomi led the effort to develop these geostationary instruments, as well as the computer tools to convert these new streams of weather data into visual images. Today, NOAA operates two geostationary satellites, one to view the eastern half of the US and one to view the western half. Spare satellites are also kept in orbit in case of a sudden failure of one of the operational satellites. These satellite images now permeate the daily weather reports we see on television, the Internet, even our mobile phones. While weather forecasters routinely analyze images from these weather satellites, much of the data never reaches forecasters’ eyes. Most satellite observations go directly into numerical weather-prediction models. A weather forecast is only as accurate as the observations that go into the forecast at the beginning of its run; this is referred to as the initial conditions. In fact, today’s weather-forecast models rely on satellite data more than on any other source of weather observations to set these initial conditions. Location, because climate can be defined for a globe, a continent, a region, or a city. Time, because climate must be defined over a specified interval. Averages and extremes of variables such as temperature, precipitation, pressure, and winds. Local and national weather stations have for years kept recordings of temperature, humidity, precipitation, and wind speed. If you are interested in the climate of, say, a city, we can derive that climate from the weather observations made over a long time period. But that climate story is an incomplete story, compared to what satellite observations can tell us. They provide the global view of various climate-related parameters including temperature, humidity, ozone concentration, cloud distributions, land and sea surface temperatures, volcanic ash, lightning, precipitation, and wind speeds and directions. The disadvantage of satellites is that continuous observations thus far only span about the last thirty years: not a long time period in climate studies. The cryosphere describes the portions of Earth’s surface covered with ice. The shrinking of mountain glaciers is only one component of Earth’s changing cryosphere—changes linked to a warmer climate. There have also been changes in the amount of sea ice, and these changes are monitored from satellites. The melting of Greenland’s glaciers is also now measured with high accuracy from space by measuring the gravity field of Earth. This is a better measure of glacial melt than monitoring sea-level rise because the sheer mass of glaciers generates gravitational pull and draws water closer, raising nearby sea levels. As glaciers melt, this pull weakens and adjacent sea levels fall. Satellite data tells us that the Greenland ice shield lost 240 gigatons of mass between 2002 and 2011—enough water to supply the state of Wisconsin for over 150 years (about 7600 million gallons of water in 2000). Satellites can measure when plants green up in spring and become dormant in fall. Observations over the northern latitudes show that vegetation growth increasingly resembles the lusher latitudes to the south. Satellites can better monitor cloud conditions across the globe. While patterns of clouds fluctuate in routine and random cycles, the total amount of cloud cover across the globe remains relatively constant at about 70%—despite changes in other climate parameters. We are currently in the apogee of satellite observations. Today, the U.S. has more than 110 space-based instruments observing our planet. But future systems in development will be even better, helping to improve our ability to monitor climate and global change. As climate is a global phenomenon, other nations have just as much interest in observing Earth from space. International collaborations organized through the World Meteorological Organization offer a powerful way to understand weather and climate on a global scale. As an example, an ambitious project set to begin in 2015 called the Global Precipitation Mission aims to use a constellation of international satellites to map global precipitation patterns every three hours. Different countries are providing both satellite platforms and instruments that contribute to this mission; in addition to the two U.S geostationary satellites orbiting in a fixed position about 22,500 miles above Earth, the Europeans will have two and Japan, India, China and South Korea will each have one geostationary satellite contributing data on rainfall. Because weather moves rapidly from one place to another, tomorrow’s weather is influenced by today’s weather far upstream, and next week’s weather can be affected by today’s weather a continent away. For this reason, it is important to have lots of data from every part of the world. These satellite data are shared among participating countries (and with the public: see www.ssec.wisc.edu/data) so that we have a complete global picture of clouds that capture the movement of weather systems across the globe. Another cooperative project is the Global Climate Observing System (GCOS), an international collaboration dedicated to ensuring sufficient observation to characterize the state of our global climate system and its variability. GCOS focuses on integrating existing systems of data collection—from satellites to local air quality monitoring systems—to maximize the tracking of climate issues. We often take for granted the bird’s-eye view of Earth that satellites provide. Yet observations from satellites are foundational for decisions on climate, and are required to monitor the climate system as well as the natural and human effects on that system. While these satellites provide the fairly accurate weather forecasts available in nearly every media imaginable, think of what further insights about our Earth and our changing climate the next generation of satellites will provide. You can be sure that engineers and scientists across Wisconsin will be involved in the design and analysis of these wonderful and essential instruments.